Syfy has announced the first casting for its upcoming supernatural drama pilot, “Dominion,” with the signings of Christopher Egan, Tom Wisdom and Alan Dale. Produced by Universal Cable Productions, the pilot is set to begin shooting later this month in Cape Town, South Africa. 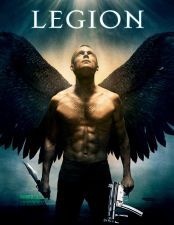 Based on characters from the theatrical film Legion, “Dominion” is an epic supernatural action drama set 25 years after the events of the movie and picking up in the aftermath of a catastrophic war between an army of angels and mankind that has transformed the world. The series follows the perilous journey of a rebellious young soldier who discovers he’s the unlikely savior of humanity, set against a backdrop of the ultimate celestial battle as it touches down on earth. Scott Stewart, who co-wrote and directed Legion, is back to direct the pilot, and is one of the project’s Executive Producers. Michel Litvak and David Lancaster of Bold Films, who produced the film, are also Executive Producers. Vaun Wilmott wrote the pilot and is Co-Executive Producer. Christopher Egan plays “Alex Lannen,” an orphan with both a rebellious and protective streak. Handsome, heroic and fearless, Alex is classified as a “grunt” soldier in Michael’s Archangel Corp but he is destined for more than his lowly classification in Vega’s post-Extermination War society might indicate. Tom Wisdom plays “Michael,” the greatest of the warrior archangels. Scarred by millennia of battle, Michael is stoic, inscrutable and haunted. Instrumental in helping humanity defeat the angels during the Extermination War, Michael is now entrenched in Vega, using his superior supernatural abilities to defend the city’s inhabitants from enemy attacks. Alan Dale plays “Rysen,” the general who led the humans to victory against the angels during the “Extermination War.” Responsibilities weigh heavily upon him as ruler of Vega (once known as Las Vegas), one of four cities left standing after the war. He now finds himself negotiating politics in the heavily militarized city, maintaining calm over its stratified society and keeping a watchful eye on his daughter, Claire.